I have a list of popular science book ideas that I occasionally revisit – things I quite fancy writing in the future. Now I have to cross one of them off the list, because Simon Flynn has written it for me. 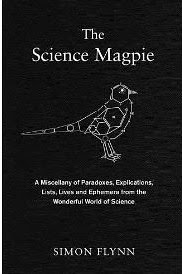 My list describes it as a popular science version of Schott’s Miscellany, but Flynn has called it by the (to me, rather clumsy) title The Science Magpie. At least, that’s what I assume it is, because I have to confess, I’ve never read Schott’s Miscellany, so I don’t know what it contains – I merely assume it’s this kind of kaleidoscopic mix of all manner of facts, from the quite interesting to the downright weird. It’s the sort of book you can imagine Stephen Fry curling up with of an evening before hosting QI. Inevitably in such an inspired hotch-potch there will always be some entries that inspire more than most. I loved, for instance, real molecules with silly names, the 1858 Cambridge University exam questions and the curly snail periodic table. Other parts are more ‘Hmm’ moments, like a whole page of digits of pi, while still others simply get a little dull. Often this is a transcription of a historical document – I have fallen for this one myself. They fascinate if you are researching the particular topic, but to the general reader they can fall a little flat. The nice thing though is that, even if there’s a topic that doesn’t really grab you, you know that in the next page or two there will be something completely different. There is no order to all this, it is just stuff accumulated at random, like one of those wonderful old fashioned museums where you get a Victorian vacuum cleaner alongside an Egyptian mummy. Delicious. If anyone ought to know what grabs the science reading public’s attention it’s Flynn, who used to be MD of Icon Books and is now training as a science teacher. I know this is going to be a book that will find its way into many science loving people’s present piles.